Provide comfort for the family of Tyson Coleman with a meaningful gesture of sympathy. Tyson James Coleman was born November 11, 1983 in Grand Rapids, Michigan to James Lee Fruge and Endora Coleman. Tyson went to be with his Lord on Wednesday, December 19, 2018 surrounded by his family. He leaves behind his legacy to his parents: James Lee Fruge and Endora Coleman, His son: Tyshun Coleman, one brother: James Lee Fruge Jr., two sisters: Clorissa Fruge and Jalisa Coleman, cousins, friends and family. Public visitation will be held on Wednesday, December 26, 2018 from 1:00 PM to 4:00 PM at Ivy K. Gillespie Memorial Chapel, 1865 Eastern Ave SE. Funeral Services are scheduled for Thursday, December 27, 2018 at Mt. Zion COGIC Church, 718 Lafayette Ave SE, at 11:00 AM. Friends may meet with the family an hour prior to the services at 11:00 AM. To send flowers in memory of Tyson J. Coleman, please visit our Heartfelt Sympathies Store. 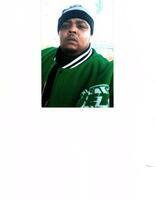 Provide comfort for the family of Tyson J. Coleman by sending flowers.